Healthy Mothers, Healthy Babies of Broward has been a community leader in providing services to pregnant women, teens and families for more than 20 years. We provide access to prenatal care, education, advocacy and public awareness for all families in Broward County, but most especially for those who are unable to afford private care. First, I want to thank all of the Board, Administration, Staff, Volunteers, and clients who have been associated with Healthy Mothers Healthy Babies of Broward County over the years, and all of those who continue to work through the good times and tough times as well. I would also like to thank all of you in the audience today – this is truly a great turnout for a really helpful cause – and you can all feel proud to be part of this worthy cause that DIRECTLY affects our citizens here in Florida. I greatly appreciate my staff from the Child Development Center of America who have come here today to support us. Thanks to all of our friends and family in the audience. And lastly, I would like to thank my beautiful and patient wife, Jackie who is truly my muse and has made this part of my life so interesting and productive – and so full of love. While I am thrilled to have received this honor today as an expression of the work that I have done throughout my career, I had an ulterior motive for my involvement in today’s event. When I first became associated with Healthy Mothers over 2 decades ago, we were knee deep in cocaine babies over at Broward General’s NICU. The children had complex medical problems and their unknown future cast a strain upon the rest of our community. There was a great deal of prematurity and birth problems and – what were we going to do with all of these children? Healthy Mothers was there to help. Then, the AIDS epidemic started to emerge. All of a sudden questions arose about that new epidemic and what would happen to the children and to their families? And, soon, we found that by giving antiviral drugs to the mom, even late in their pregnancy, we could reduce the incidence of congenital HIV infection by over 50 percent! And HMHB was there with services to help families and children. So today, I am here to ask to join HMHB’s infrastructure – in some way – so that we can begin to tackle the mystery of our newest epidemic – Autism. The number of children who are affected is staggering – as high as 2% of all male children in the US. Are the numbers real or are we just recognizing it better? The short answer is, they’re real. I saw my first patient with autism in 1975 – I didn’t miss the diagnosis all of these subsequent years. The second most common question – is it due to the childhood vaccinations? To me, the accelerated schedule with possible over-vaccination MAY be adding to the problem in SOME cases. Autism Spectrum disorder is an epidemic of the 21st century. Epidemics in human beings are environmental, and it appears that the part that genetics plays is in ‘susceptibility’. 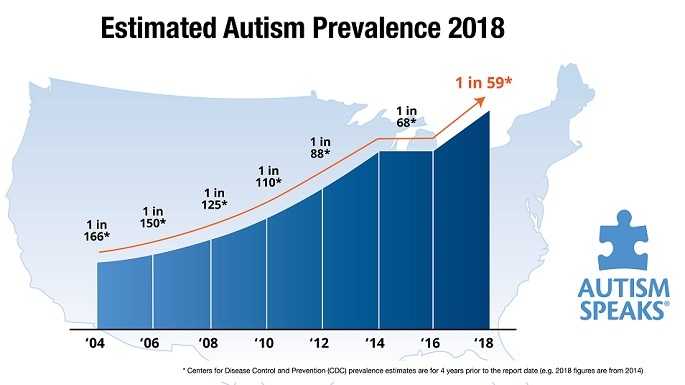 We need to stop debating whether or not there are more children with a medical condition called AUTISM, we need to start diagnosing and treating them appropriately as early as possible. At this time there are no miracle cures, but doctors such as myself see lots of miracles every day. We treat many, many children who smile or laugh for the first time, begin to speak, and emerge to become part of their family and who can eventually be expected to lead productive and happy lives. Together with HMHB Broward County, I hope that we can find some answers and help the affected kids and their families today and even find answers for the children of tomorrow. Thanks again for this honor, HMHB! This entry was posted on Friday, May 11th, 2012 at 3:41 pm	and is filed under >ALL<, Alternative and Complementary Medicine for ASD, Asperger's Syndrome, Holidays & Vacations, Patient experiences. You can follow any responses to this entry through the RSS 2.0 feed. You can leave a response, or trackback from your own site. My husband Nick and I were just discussing this Mother’s Day how wonderful it was when Ben finally came out of the brain fog and started calling me Mommy at 2.5 years old, just three months after we first met Dr. Udell at the Child Development Center of America. I shudder to think where he’d be had we not been able to work with you to diagnose and treat Ben as early as we did. Thank you for all that you do and continue to do for our children. Hi just wanted to give you a quick heads up and let you know a few of the pictures aren’t loading properly. I’m not sure why but I think its a linking issue. If you (or other readers) can tell me the pages that are a problem, I will ask the web-people about it. Last eve I tried several browsers on many pages without problems. Thanks for the heads up… I care about the look and content of this information. Hola! I’ve been reading your blog for some time now and finally got the courage to go ahead and give you a shout out from Houston Tx! Just wanted to mention keep up the excellent work! for his site, as here every material is quality based information. Yes, and I also make sure that the site isn’t used as a free advertisement for (especially non-related) entities.